Up to this point, Bradley has been, shall we say, rather indifferent to books in general. I know other moms who swear their babies are totally engaged in the pictures at just four months of age, but that has not been the case with Bradley, who is now 10.5 months old. That's not to say he hasn't had a relationship with books. In order to placate me, he will occasionally look at a couple of pages and beat his palm on the pictures. And he loves to get a good mouthful of cardboard pages or hear the rustle of crinkling paper. But as far as sitting down and basking in the reading experience? Um, not so much. And then, all of a sudden on a normal, average day last week, a switch flipped. It is not for lack of trying that Bradley has not appreciated books. On a daily basis, I put him on my lap while I read to Aaron and Max, but he usually squirms off within the minute. But the cover of Baby Bear Sees Blue captured his attention...and he laughed. I opened to the first page, which showed Baby Bear and his mama...and he laughed again. As a disclaimer, I have to say that if you know anything about Bradley, it is that it doesn't take much to get him to laugh...life's a big joke to him. But this was unusual even for him. He seemed genuinely delighted by the pictures. And as we progressed through the story, I could see why. The illustrations are vivid and bold with the focus being primarily on the bear and his mother and the backgrounds being washed out and less detailed. I didn't know it when I put it on hold at the library, but it is a book about colors. As Baby Bear and his mother go about their day, he asks questions, like, "Who is singing to me, Mama?" and the mother answers, "Those are the jays." And then on the next page, we see the jays and the text says, "Baby Bear sees blue." The thing I love about this book as opposed to other books with a similar focus is that the colors are explored in a subtle way. When Baby Bear sees red, the accompanying illustration is not overwhelmed by red objects. Instead, there are just a few red strawberries that Baby Bear is eyeing greedily. Another thing I love about this book is that along with colors it also explores the senses: touch ("Who tickled me? "), sight ("Who is waving to me? "), smell ("What smells so good? "), and sound ("Who is growling at me?"). Taste is never really mentioned, so maybe the connection with the other senses wasn't intentional, but it is a detail I like nonetheless. I read through the book slowly, carefully...Bradley laughing at every page, the other boys completely engaged. I was almost afraid to move, and as I came to the final page, I looked at Bradley in disbelief. Had he really just sat through an entire story, and not a short board book at that? At first I wondered if there was something specific about this particular story that captured Bradley's attention. But as the days have passed, he has been sitting and looking and listening to many books, so it seems he is finally joining the rest of us in our love of reading. 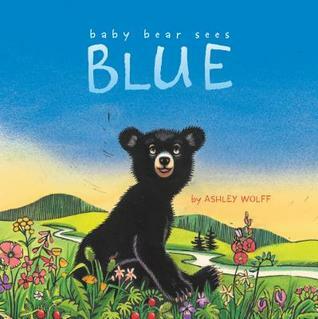 But regardless of what other books he likes in the future, Baby Bear Sees Blue will always be special to me because it was Bradley's springboard into the wonderful world of literature. Thanks for the sweet review, Amy. I DID intend the allusions to the other senses and I hope those strawberries cover taste! Welcome to the world of books, Bradley. It is always a comforting and a stimulating place to live. Ashley, thank you so much for your comment! And now I'm kicking myself for not making the connection between strawberries and taste! Of COURSE! :-) Really, thanks so much for taking the time to leave a comment. It means the world to get the author's insight! We just read "When Lucy Goes Out Walking" this week and loved it, too. Also, I should mention that Bradley received "Baby Bear Sees Blue" for his first birthday. I couldn't resist!